Email, Skype, ICQ, telephone, paper mail. You can also request a callback. Basic articles, FAQ, glossary, simple video tutorials. Daily market reviews, economic calendar, news, some really basic charts. 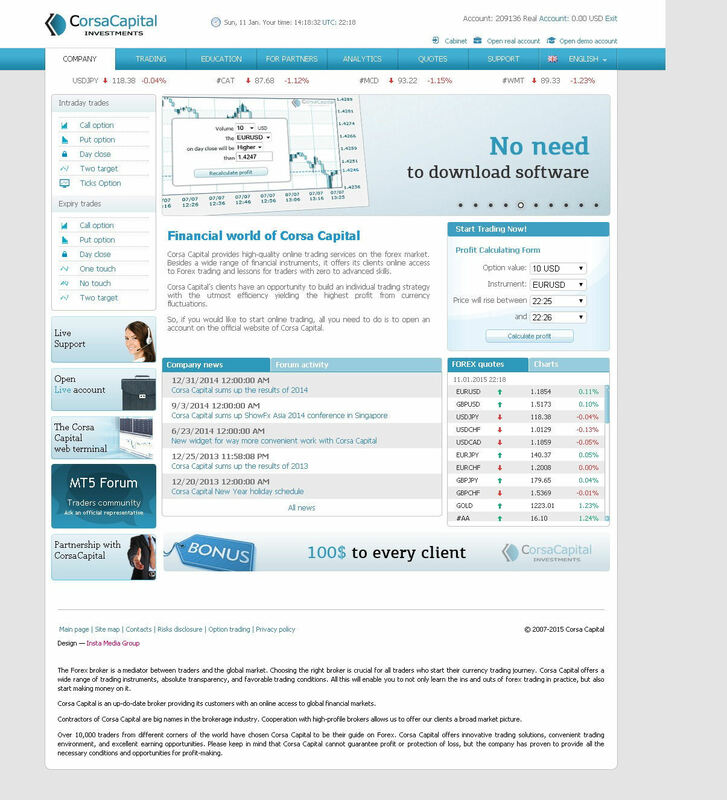 Corsa Capital Investments is a binary options broker based in the British Virgin Islands and originating from Russia. They are unregulated (despite prominently mentioning the British Virgin Islands Financial Services Commission), and do accept USA traders. They are however one of the most dubious brokers I have ever reviewed, and I would not recommend that any trader open an account with them. Why not? I will go over all of the reasons as I discuss the features below. Corsa Capital Investments seem to have actually made it their goal to make their language as incomprehensible as possible. There is nothing intuitive about the organization of their information, and there are lots of gaps. On top of that, the company seems to have gone out of their way to try and sound technical without actually making a lot of sense. 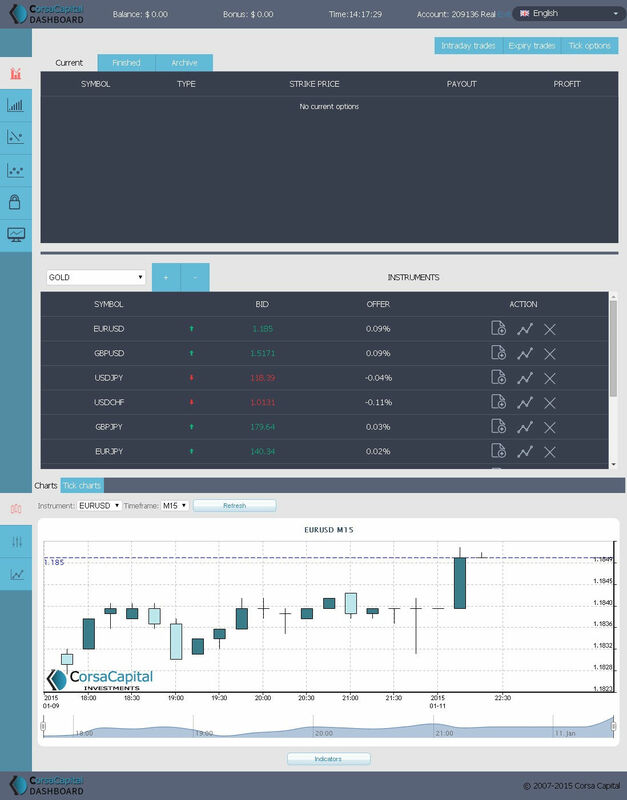 Their aim is to look like a cutting-edge, professional Forex website, whereas in reality they are a scammy, low-quality binary options website—and really, probably no more than a front for a simple scam. They want to confuse you while at the same time drawing you in. While a number of methods are discussed on the site, the only actual deposit and withdrawal options appear to be wire transfer and Qiwi. Why can’t you deposit with your credit or debit card? This is a major issue. In theory, there is a “no deposit” guaranteed $100 bonus for all traders, and you can start trading right away. But you can only apply a tiny percentage of the bonus to each trade, so effectively you cannot make a lot of money. You can never withdraw the bonus, but you can withdraw your profits—but only if you deposit $50 first. This is very confusing and has been a grievance point for a lot of traders. None of this exactly shouts “trustworthy,” does it? I am not sure whether this was the result of an error, the day I chose to review the site, or what, but I could not get any options whatsoever to show up in the main dark blue window. All it would say was “No selected options” no matter what I did. Scrolling down, you can see rising and falling assets on a list, and below that, a chart. In the list, there are more mysterious pictograms. Clicking on one of these will bring up a box which offers you the chance to place a trade. You can choose an option type (from a seemingly limited range), an option value (anywhere from 10 cents to $1,000), and select an expiry time (for High/Low) or two times during the day that price will “rise between.” Or you can do a Tick trade and specify how many ticks a given trade will rise (no expiry time is mentioned). I cannot even begin to list how many things are wrong with this platform. It is very hard to navigate, does not appear to load properly, and it is terribly unclear what you are getting yourself into with some of these trade types. And why is it so hard to find the simple One Touch and Two Target trades? And what is the point of the Tick trade? Even if the expiry time was clearly specified, it seems like it would be nearly impossible to specify the exact number of ticks the price would rise. This does not look like a trade type you could ever win. Usually at this point I start talking about resources and tools, but it is hardly worth mentioning the basic articles and simplistic video tutorials on this site. They make it look like they have a lot of resources, but they don’t. They do list a huge number of contact methods for customer service, including emails, telephone numbers, and Skype and ICQ IDs for many different departments. But they do not even offer live chat on the website, something I would expect to see on any binary options website. And then there is this company’s reputation. To start with, they seem obsessed with trying to convince you they are somehow associated with MetaQuotes Software Corp., the company that makes MetaTrader 4. They are not! They have an associated website called MT5.com, which has nothing whatsoever to do with MetaQuotes or MT4. All these “MT5” references on their site are very confusing and misleading. And what about Corsa’s real reputation? They are affiliated with a spot Forex trading broker called InstaForex – a company with poor reputation – visitors of EarnForex.com rated them 2 stars out of 10. Corsa has received poor ratings on a number of other websites as well. Customers complain they are hard to work with and have confusing terms surrounding their bonuses and withdrawals. I recommend staying away from them. There are literally no grounds for recommending them, and there are so many reasons to avoid them. Check out our recommended brokers instead!